RUSH: Imagine if threats against conservatives were treated with the same concern as threats against homosexuals. But, no, instead Twitter, which is the cesspool and the sewer that keeps all of this destructive drivel and crap alive and blossoming. Twitter is refusing to delete the numerous calls for violence against the Covington Catholic students. There are countless calls for violence that Twitter will not pull down. They are still there. They’re still being posted. Twitter has pulled down the original post that got all of this started, but they will not pull down any of the numerous calls for violence against the Covington Catholic teenagers. The children. Imagine if the left’s concern for the children was actually genuine, which, of course, it isn’t. Twitter is also refusing to suspend the accounts of those making the threats. Meanwhile, the Covington Catholic High School has had to close today for security reasons, and guess what? No, no. The media is leaving open the possibility the school is closed today because of weather, not for security concerns, even though the principal of the school wrote a letter to parents saying they were closed because of security concerns. 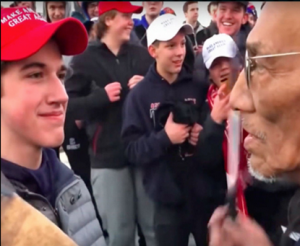 There is no state-run system for collective punishment; there is instead individuals calling for all colleges to express skepticism about any applicant from Covington Catholic High School. We have a leftist Democrat mob of anonymous jerks and bullies using social media to get people fired to have their businesses destroyed, to have people’s reputations lied about and ruined! All with the support and encouragement of Silicon Valley and high-tech leaders, who refuse to clean up the cesspool and the sewers that their businesses have become. Just because of the pressure of the mob… Anonymous, lying jerks hiding behind false identities on Twitter and on Facebook and other places. Imagine if there were an actual journalism community exposing this and telling the American people that 90% of what they see on social media is abject untruth. But, of course, that won’t happen because all this that’s happening on social media is exactly what American leftists led by the American media want to happen. Nobody tore up the Constitution. Instead, groups of people nobody ever heard of and still don’t know who they are and incidentally a bunch of people in pajamas that have zilch power whatsoever have ended up imposing a new system of mob tyranny via social media on the American people.